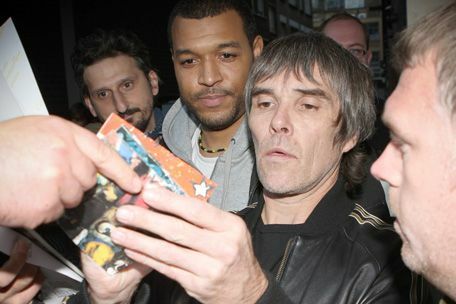 The Stone Roses have reformed to "satisfy" their fans' dreams and "lift people up". The seminal Manchester indie band announced yesterday (19.10.11) they had reunited after 15 years apart for a world tour and to write a new album, and bassist Gary 'Mani' Mounfield insists the four-piece haven't got back together for money. The musician - who joined Primal Scream after the group finally dissolved in October 1996 - is determined to get back on the road and perform for fans who stayed loyal to The Stone Roses. "People have got dreams that they want to see happen, it'd be nice to satisfy their dreams and get it done because I'm getting f***ing sick of being asked the question and answering it." Frontman Ian Brown is also adamant the band - which also includes guitarist John Squire and drummer Alan 'Reni' Wren - haven't reformed for cash because they have turned down huge money offers in the past to reform. The 'I Am the Resurrection' singer - who has released six solo albums - said: "The money has always been on the table you know, we could have took that money any time we wanted, every year, two or three times a year we've had offers all the way down the line. "We've not seen each other, so how can you bring back a band with the spirit to warm people up and lift people up if you've not even spoken to each other?" The first tentative steps towards a reformation started after Ian and John met up again after not speaking for over a decade at the funeral of Mani's mother earlier this year. Although the band have confirmed two dates at Manchester's Heaton Park on June 29 and 30 next year and plan to follow the concerts up with a full tour, Ian insists they aren't thinking too much about the future. The singer said: "We'll ride it 'til the wheels fall off like we did last time. And they did fall off, didn't they? If we didn't think we had it in us we wouldn't be sat here wasting our own time or anybody else's time."